Mixed matches are more complicated relationships than those between people from similar backgrounds. As much as we would like to believe that “people are just people” or that “love conquers all,” every layer of difference introduced into a relationship adds more complexity and new challenges. Differences in cultural and family styles may be fascinating, but they are also alien. 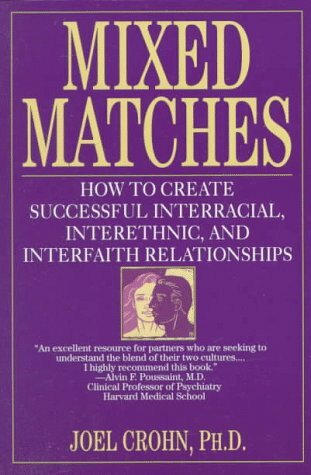 Those traits that initially seem so attractive can ultimately lie at the roots of the most difficult problems… These … don’t mean that mixed matches are doomed to unhappiness. Millions of families around the world can testify to the possibility of finding satisfying answers to the questions raised by cross-cultural relationships. But as in all complex and worthwhile enterprises, the most successful people tend to be those who are willing to face the issues at hand and work on them. Couples who develop the skills to deal with the personal, interpersonal, and social issues that are part of being in a mixed match are the most likely to find ways to use their differences to build strong and rewarding relationships. I think this statement hits home because, in spite of the strength of our own cross-cultural skills, it is our willingness to “deal with the personal, interpersonal, and social issues” that we face that has been most valuable in our relationship. The fact that we’re both communicators and processors helps us to build bridges to each other when we feel far apart. What about you? What speaks to you in these words?